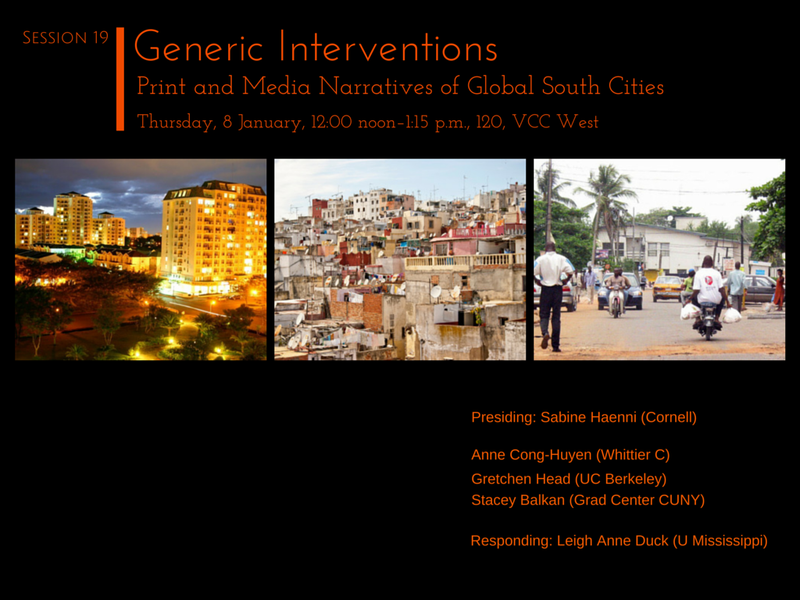 In focusing on urban sites of the Global South that have been and remain the location of rapid industrialization, technological development and concomitant social (often transnational) fractures, this panel asks how generic narrative structures both portray and intervene in dominant ideas of development. Comparative and collaborative analysis across spaces that have experienced colonization and acute economic exploitation has been a priority for postcolonial discourse since before the Bandung Conference, and Global South studies offers the additional opportunity to examine contemporary forms of deterritorialized capital, which is particularly visible in urban areas. Because such scholarship requires engaging realms of knowledge that extend beyond not only research conducted in a particular language but also interdisciplinary area studies (such as African, Latin American, or Southeast Asian), our goal is, in part, to expand dialogue on the Global South at MLA. Momentum for this shift increased at the 2014 convention, as panels explored the methodologies associated with specific global regions (“Futures of South-South Comparison”), questioned the term “Global South” from the perspective of diverse nations and global regions (“What Is the Global South?”), and considered the institutional contexts and material media through which such conversations have occurred in the past (“World Literature and the Global South”). We pursue this goal through addressing spatial and formal concerns shared across geographies: the genres used to interrogate urban experience. Ten years after a special issue of Social Text on “Global Cities of the South”—a decade that has been shaped, in narrative studies, by the emergence of world literature as a powerful paradigm in dialogue with comparative and postcolonial literatures—our study of urban genres in the Global South combines close and distant reading practices to consider how local circumstances and broad narrative patterns mutually intervene. Without presuming that genre works in a singular way, and without presuming that genres work in the Global South in the same way they do in the Global North, it examines the multiple ways in which generic structures are appropriated and mobilized for a critique of often ruthless urban development. To that purpose, we explore genres across print and film media. Papers will be held to 16 minutes in order to allow time for a brief (5-minute) response, which will emphasize how these analyses of distinct narrative forms and spaces contribute to scholarship concerning narratives of the Global South. It’s a bit of a shift from my recent DH-oriented work, but I’m excited to present some my newer media/urban studies work on Vietnam. For full paper descriptions, refer to my earlier panel proposal post. I’ll post the paper following the panel. Spoiler alert: I was way too ambitious in the abstract so hopefully it all makes sense in the end! At the very least, I’ll get some much-needed feedback and have a chance to share some cool images and information of a place I can hardly comprehend myself. *If you’re interested it submitting an article to the special issue of The Global South on this topic, the deadline for initial proposals has passed but you can send inquiries to Sabine Haenni (sh322@cornell.edu) and/or Leigh Anne Duck (lduck@olemiss.edu). Essays of 6,000-8,000 words will be due by March 2015. “طنچة/Tangier” by José Sáez is licensed CC BY-SA 2.0.